As an author of Fantasy Fiction, Courtroom Drama, and Horror, no one ever expected Dedra L. Stevenson to compile a book of her favorite international recipes, but three years ago, she started exploring food from around the planet for Ramadan, as it was a way to teach her family about the cultures of the world. Once the word got out, her recipes stirred a great deal of interest, and her unique approach to Ramadan cooking became a hit! 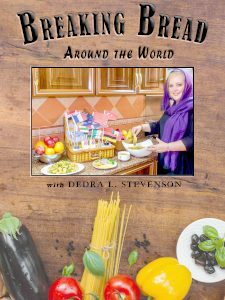 Breaking Bread Around the World provides easy meal plans for 30 different countries, and a bonus chapter with extra recipes for breakfast, side dishes and a few extra desserts. The book is also Vegan-friendly, as there are a generous number of Vegan recipes included! There’s photos of all the food available, and Dedra’s personal notes on each country, thereby providing a bit of travel information as well. All in all, this cookbook is a great addition to any library, and a portion of the profits are donated to charities that feed the needy, so you can’t go wrong with this one!